G & S Pools did a great job on our in ground pool. The crew are great workers. Matt & Frank are sweethearts. We Love Our New Pool. Thanks G&S! Have been using them for years. Chris from G & S delivers top notch service. Never had a problem. When Frank, Matt and their team installed my pool six years ago, I was duly impressed. From installation to maintenance, you and your entire staff have been prompt, courteous, professional, and knowledgeable. I would highly recommend G&S to anyone thinking of installing an in ground pool! You all are simply the BEST!! Roseann Esposito, Bulls Head, Staten Island N.Y. I must say the most professional people and BEST install of in ground pool I have seen. Matt and Frank (owners) were on site everyday , working just as hard as the workers until completion. I would HIGHLY RECOMMEND them 100% . The in ground pool came out PERFECTLY level and flawless install. Great family to deal with and I am so HAPPY I used them. In the Store the entire family is knowledgeable . A++++!!! 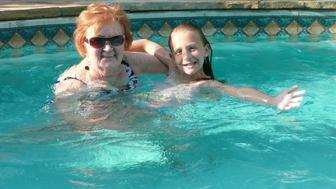 I have used G & S Pools for the past 13 years and my experience has been very good. I have always found them to be very responsive to questions and to perform repairs when needed. -Lester Blair, Sunnyside S.I., N.Y. They are awesome. They are punctual and professional. Everyone who has come out knows their job. They always go beyond their job without exception. Their knowledge is their strongest attribute. -The Marcus Family, Westerliegh, S.I., N.Y.
Chris, I just wanted to thank you for the excellent job your men did installing my liner last year and then opening my pool this year. Joe was excellent. I am very very happy. G&S is a professional and knowledgeable company. It is evident that they take pride in their work. The work was started on schedule, and we are impressed by how organized and neat the installation was. The process couldn’t have gone more smoothly. They were helpful in guiding us throughout the entire planning and installation, and their store is available for any questions and assistance needed with maintenance. We couldn’t ask for more. Best of all, the yard looks great! Frank and the boys really have this “POOL THING” down. -Murray Klein, Staten Island N.Y. I went into the store for the first time last year, I was totally impressed with the young people who work there. I came back this year again impressed with the young people, very helpful and friendly . Young people today usually are “not happy” with working. But the kids in this store are wonderful ! They never make me feel like I am bothering them. I did purchase my pool from somewhere else because a friend said he could get me a deal (it wasn’t that great ) but I will not go back there. They are NOT helpful and the customer is bothering them! Go to G&S you wont be sorry. This is one of the best contractors I ever had to deal with. They did what they said they would and installed a pool in 5 days start to finish. They are highly recommended from me I wouldn’t .. use anyone else. I’m a firm believer in you get what you pay for……… I loved the fact that the owner was on the job everyday and also worked. Hugs and kisses to the G&S crew for a job well done. What can I say about G&S to sing their praises? This company is very professional yet feel like family when they greet you at the door. The knowledge they have and expertise they showed while installing my pool was limitless. The crew was very nice and the install went off without a hitch in five days. The best part about this company is that they not only install the pool, they have a very knowledgeable staff in the store to answer all of my questions regarding chemicals, my filter and even toys for the kids. I have nothing but great things to say about the staff and this company!!! Thank you G&S for making Summer fun!!!! Back in 2004 we had our pool put in by Montalbanos. From the day of installation we had nothing but problems. Since 2005 G & S has been more than fair offering us top notch service at very reasonable prices. We just had our liner redone back in April and now that the weather is getting nice we are all ready for a fun filled summer. Thanks again Chris for the top notch service! See you during the summer! I cannot say enough about G&S Pools, I have been dealing with them for quite some time now and I honestly cannot say one bad thing about them. Dealing with Chris from replacing my liner to opening and closing my pool each year has been nothing but excellent service from Chris and his crew. They are always helpful they go above and beyond no matter what the problem might be. I highly recommend this wonderful family run store, they can’t be beat. G&S is the “Real Deal”, from the very start of deciding on a pool suitable for our yard they were there going over every step. They took their time explaining the whole process, and were professional throughout. In 3 days from the initial dig the pool was in the ground fully functional, their staff were totally professional, courteous. The pride and commitment that G&S showed from the beginning was quite impressive, and continued throughout. Bring on the Summer, a big Thank You to the entire staff of G&S the Briscoe’s of Great Kills are going to enjoy their pool!!!!!!!! Looking forward for the summer! Thanks for the consistent reliable service guys! see you in May! 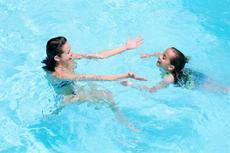 We have gone through several pool companies over the last few years until we found G & S pools. In my opinion they are hands down the best! They far exceeded my expectations for quality service and reliability. We have had many problems with our pool (water issues, earth leaks, pump problems) and they have been the only company that actually knows how to diagnose the problem and fix it properly. They will explain everything thoroughly to you and go out of their way to resolve your issues. They go above and beyond to make their customers happy. Especially the owner Chris, who is so knowledgeable and has walked me through several issues I’ve had over the phone with patience and professionalism.